Ah, New Year's Eve is a time for champagne, fun and reflection. Today's New Year's Eve, though, should have special meaning to many in the Snooze Button Generation because it also is Paul Westerberg's 50th birthday. Yeah, that's right. Westerberg turns 50 today. Holy crap! We are getting old. I stumbled across the Replacements in high school. Being from Cleveland and in the Snooze Button Generation, I really didn't think music beyond classic rock, hair bands and pop existed until well into high school. The Replacements are a pretty darn good rock band that isn't really considered "pop." I have always liked them. Almost all of their albums are excellent, and it's a toss-up between "Let It Be" and "Tim" as their best album. 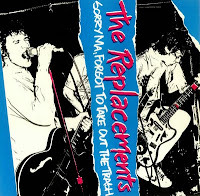 I have been revisiting the Replacements of late and Westerberg's newer solo stuff. Not to put down his drunken Replacement bandmates, but his solo stuff has helped me realize how talented he is and how much authentic emotion he puts into his tunes. Wow. That was a solo performance at the Warsaw Room in Brooklyn, N.Y., on Aug. 26, 2002. I could watch it a million times, still be enthralled and feel what he's feeling every time. The Snooze Button Generation thanks you, Mr. Westerberg. ... Welcome to 50! This next clip is from two years ago, and all I can say is, yeah, I agree. Thanks for understanding. "Everyone's Stupid."